Super typhoon Lan, described as "very large" and "very strong" by Japan's Meteorological Agency, was packing gusts up to 252 kilometres (157 miles) per hour Saturday above Pacific waters south of Japan. 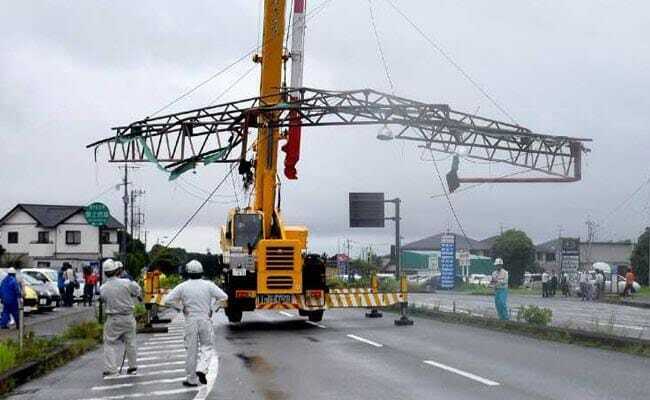 Tokyo, Japan: A powerful typhoon was bearing down on Japan Saturday, a day ahead of national elections, with experts predicting severe winds and heavy rains as the country goes to the polls. As Lan drew closer, voters on remote southern islands in the path of the storm cast their ballots early for Sunday's election. The Joint Typhoon Warning Center of the US Navy called it a super typhoon. The Japanese agency said Lan would move just east of Okinawa Sunday before grazing the country's coastal areas, possibly directly hitting Tokyo or surrounding regions, Monday morning. Meteorologists expect strong winds and heavy rain across much of Japan on Sunday. Regardless of weather, however, national surveys have largely predicted that the ruling bloc, led by Prime Minister Shinzo Abe, was likely to claim a landslide victory. Prime Minister Abe has called on voters to cast their ballots early to avoid bad weather. Turnout has declined to below 60 percent in the last two general elections. The last vote in December 2014 saw a record-low rate of 52.66 percent.